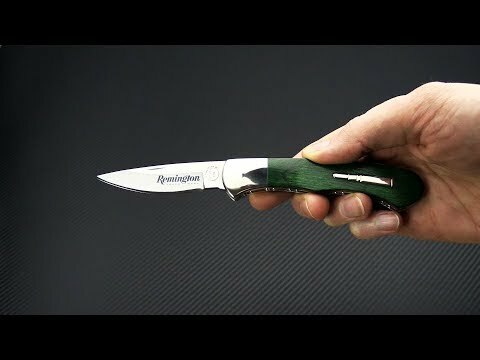 This Remington Cutlery 2019 Bullet Knife is a traditional lockback made in a 2500 piece limited production and with high quality materials and a top level fit and finish. Originally introduced in 1922 the Bullet Knife series has been produced in various patterns and continues to be sought out as a high value piece for knife collectors. This version comes with a satin finished, 420HC blade, Green DymaLux Wood handles a nickel silver bolster and "Bullet" shield. Brand new product directly from Remington Cutlery. Blade: The big bellied drop point blade is made from satin finished 420HC stainless steel with a hollow saber grind. The front of the blade has the Remington logo laser marked on the blade and the tang is stamped with "Remington UMC" and "Made in the USA". The reverse side has the tang marked with "2019" and the model number. Handle: Green DymaLux Wood handles scales are fit to a single nickel silver bolster which is integral to the thick, file-worked liners that make the foundation of the handle. The display side of the handle sports the infamous "Bullet" shield in nickel silver while the reverse side is unadorned. A simple, stainless steel mid-back lock mechanism provides smooth operation and secure lock up of the blade. Each piece comes with a storage box and certificate of authenticity. 420HC Stainless Steel: 420HC is a stainless steel that provides excellent rust resistance, ease of re-sharpening and moderate edge retention while being exceptionally tough for a stainless steel. With proper heat treat it is said to preform similarly to VG-10 in wear resistance.